A Battery is not a Tank! An EV leaves the house full with maximum range every day. 5 seconds to plug in, and 5 seconds to unplug in the morning. 2018 was peak for gas cars and declining. EV's doubled. Wind, Solar and EVs are crushing Fossil Fuels! 2016. USA Rooftops can provide 40% of the National Load 2016. See the hilarious experience of an EV driver being sold a gas car 2015. See the Powerpoint on EV misconceptions (summarizes this page). GAS-TANK/GAS-STATION Legacy: Three generations and over a century of gas-tank/gas-station legacy clouds our thinking with respect to transportation refueling. Everything we think about driving is related to the inconvenient weekly stop at the gas pump for commuters or the every 5 hour stop for gas on trips. We naturally translate this inconvient refueling experience to EV's while not realizing that none of it applies when the EV is used for the practical driving application for which it is best suited... commuting and local trips! GAS STATIONS: Gas cars must be refueled while we are using them and usually while we are in a rush on our way somewhere. This is a huge inconvenience that we have all grown so accustomed to that we ignore the inconvenience (except when we are late) while still letting it cloud our thinking about driving. As shown here in a plot of where the cars are during the week, we are constrained to go somewhere to fill-up during the 1 hour or 4% of the day when we are actually using the car to get somewhere else! PLUGGING IN: EV's, on the other hand, are always charged while we are not using them, while parked. And the average car spends more than 21 hours a day parked and most of that time is either at home or at work. As a result, the EV is usually always fully fueled every time we use it (even if it was your teenager that drove it last) and the impact of fueling is only about 10 seconds a day, 5 seconds to unplug when we leave, and 5 seconds to plugin when we park. Each of these misinformations will be addressed in the paragraphs below. EV's are not popular, only 4% will buy them: Wrong conclusion. If 4% bought electric cars, then that would make them the number one selling cars in America! As shown here, the #1 selling vehicle is the Ford F150 pickup truck(19 MPG). But still that is less than 4% of all vehicles sold. The next two most popular models sell to less than 2% of Americans. There are over 400 makes and models of gas cars on the market to satisfy the variety of driver needs and wants. If 4% of Americans bought an EV, that would make them the number 1 selling vehicle in America! Of course, we have gone from 3 models of EV available in 2010 to over 45 models available in 2018 and over 500 planned by 2025. This is the largest growth segment in the auto industry today. And when people realize the freedom from oil, gas stations, pumping gas in the cold, and our $1 billion per day overseas addiction, this percent will only rise! Pickup Trucks: Heck, the EV is even more than $10k Cheaper than the average $40k to $70k price of the #1 selling vehicle in America, the F150 Pickup. Buy Used EVs: Now in 2017 there are at least 6 years of used EV's now on the market with the 2014's now coming off their initial leases. 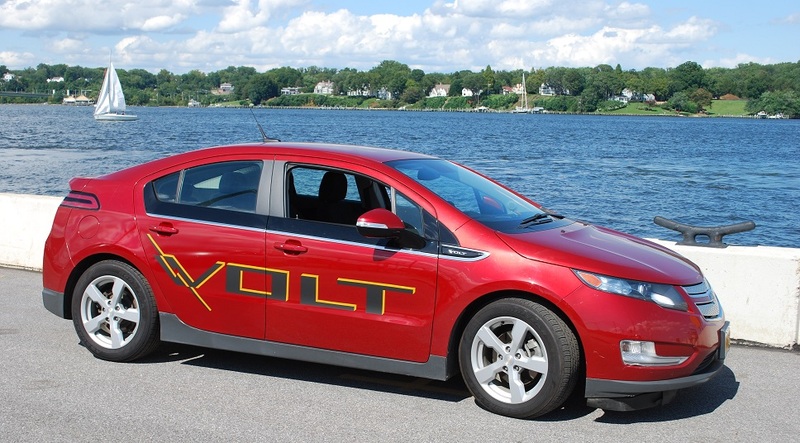 The Volt goes for under $13k and the Leaf down around $9k. Really great deals as first adopters move on to the latest and greatest. See the USED price column on the tables at right. EV Payback or Breakeven is 8 years: No, see the true comparison. Payback is from day one if you make a real apples/apples comparison. What everyone leaves out of these kinds of simple-minded comparisons is the cost of the mitigation needed to clean up the emissions of the gas car that the EV does not have. It typically takes 100 fully mature trees to absorb the annual emissions from a gas car. If the gas car had to pay for this cleanup to be cost-equal to the EV, then the true cost of the EV would be more than a third less than the cost of the gas car from day one. We buy cars for now and the future, and the future is NOW! EV Fuel is CLEAN! EV's and Solar are the perfect marriage. 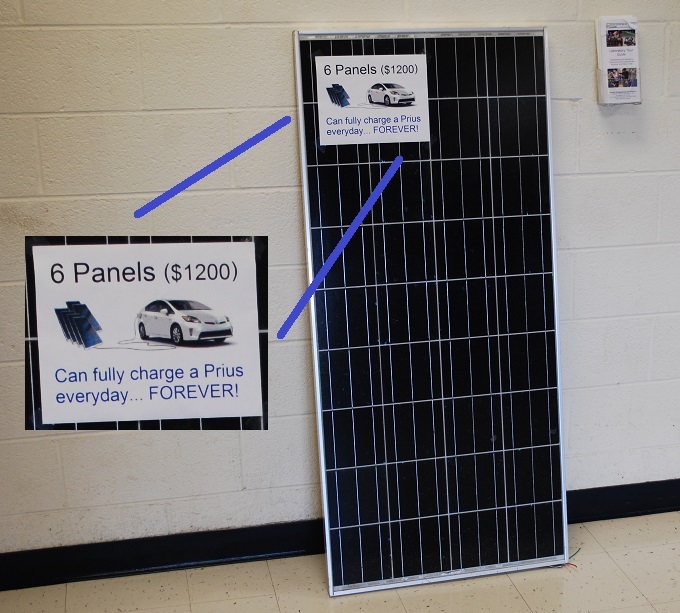 A Prius (image at right) can be fully charged everyday forever from just 6 solar panels. And any EV can be fully charged to the average American 40 miles a day from just 12 solar panels. EV Fuels is CHEAP! Not only can an EV be charged everyday forever from solar, but at normal electric rates, an EV drives for a cost equivalent of about 75 cents per gallon gas. But when recharged at night off-peak where electricity is only 3.5 cents per kWh, the EV drives at an equivalent energy cost of about 35 cents a gallon! That is cutting the cost of commuting by a factor of TEN-to-ONE compared to gas. And by 2014 some 25 utilities now offer very low cost off-peak special rates for EVs. 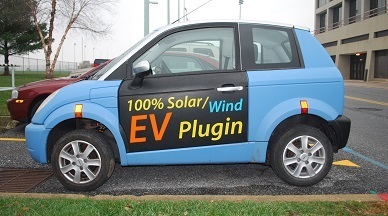 EV Battery capacity is too small: Prior to 2013, maybe, but now, over 200 miles is nominal and more than half including plugins are over 350 miles (including backup gas engine). This is a big misunderstanding. People think they want the largest battery possible when in fact, the smart EV purchaser buys no more battery capacity than he uses on a daily basis. Why spend an extra $45,000 for a 250 mile battery (Tesla) when you only drive 40 miles a day and leave the house every morning with a full charge and more than enough for your daily use. If you need to drive 200 miles in a single day, then you should not be buying an EV but should buy a plugin hybrid or Tesla or use your other car whichever you can afford. EV Range is too small: Not for the smart EV purchaser. By 2018, 50% of all EV's have ranges greater than 350 miles. And the ideal application of an EV is for daily commuting and local travel. The chart here shows that 68% of all commuters drive less than 15 miles to work and fully 78% could commute almost 20 miles each way on a 40 mile battery. If one only has one car and commuting is not their application, then a plugin hybrid is a better investment. EV's were originally not for everyone or every application, but by 2018 there is a model for almost any application! People should buy the car that does their need best. And an EV does commuting better than a gas car at 1/4th to 1/10th the cost and the added convenience of being independent of the gas pump and expensive maintenance. Just plug in while parked and the car is always ready for every trip. Range anxiety vanishes then, as an issue to the smart shopper that needs a commuter car. Interstate Charging: An insiginficant niche. It is amazing that people remain so focused on fast public charging along the interstates (gas tank legacy) when the State of Maryland studies have shown that this is only 0.3% of the need, because EV's are not optimized for long distance interstate travel! Their best application is commuting and local travel and you would no more buy an EV for how it travels on the interstate as you would buy a boat based on its trailer. [With the exception of the Tesla which is not your common EV application and not affordable to most]. 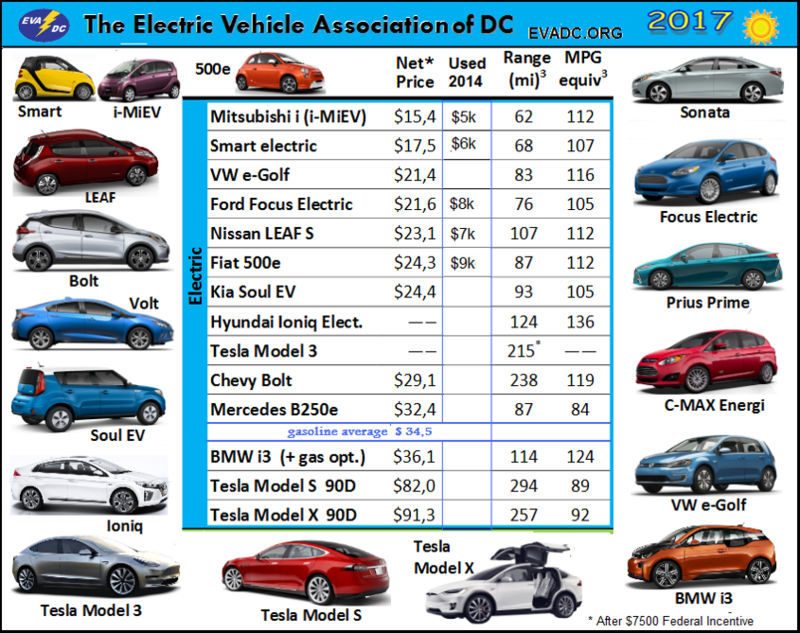 Charging at Work: The Maryland EV Infrastructure Council has determined that over 97% of all EV charging at work can be met with simple 120v outlets. This is because at-work is where most EV's spend most of their time away from home. As shown here 70% of EV commuters can be fully charged by noon if simply plugged into a standard outlet at work. The 70 mile daily commuter can be fully charged after a full day at work (35 miles in, and 35 miles home). It is unsustainalbe to think that Employers are going to provide expensive $10,000 special L2 EV chargers for employees when a simple $15 outlet (120V) will do. Charging Stations are too expensive: No, Most of them you don't need! Over 97% of all EV charging for the daily commuter can be met with the simple 120v outlet. Any outlet will do. But even a special lighted EV 120v outlet only costs $29 from Home Depot. Remember, our American Economy is 60% based on selling us more goods and services, most of which we can do just fine without. Expensive EV charging stations are a perfect example when a simple 120v existing outlet can do the same job. Chargers are often sold through the range anxiety fear factor to prospective EV owners who have still not relinquished the gas-tank/gas-station legacy. Most people have to sleep 8 hours or so, and so why would you need to fast charge your car while sleeping? The $29 EV outlet is readilly availble on line from from Home Depot. L2 Charging: Of course, if your commute is more than 35 miles each way, and you cannot plug-in while at work, sure, you need a 100 mile range EV and you need a 240V charge cord (now only about $200) to be able to fully replenish 100 miles in a single overnight charge, but these long ranging commuters are the small 8% exception and they only need the fast charger if they cannot plugin to 120v at work. And even if you have a 240 mile EV, just plugging into the $200 L2 240v charge cord overnight can still provide over 1600 miles a week which is 5 times the national average. It takes too long to charge: So, who cares? The car is parked 21 hours a day and there is plenty of time to charge while parked. An 8 hour overnight, or charge-at-work can replenish a 32 mile trip to or from work in under 8 hours. The expensive L2 Quick charger can do it in 2 hours but is not needed by most commuters during the 8 hours of sleep and the 8 hours of work! And no EV driver will routinely use a fast L2 charger at work where she has to play musical-cars in the parking lot all day with other EV drivers. Focus on the Benefits: Instead of focusing on how long it takes to fully fill an EV battery from L1 home charging, we should instead simply focus on how many miles-per-charge we get while parked for 8 hours at Home and at work as shown here. Every EV comes with its own 120v charging cord and is well capable of charging anywhere while pariked. Any EV will gain about 36 miles of charge during 8 hours on a standard outlet, and that is enough to give commuter EV's a total daily range of over 70 miles (plugging in at home and work), typical of many EV batteries for example. Even in 2011, Convenience stores were installing 120v charging outlets. I Can't plugin at work - no way to pay: Sure there is. Practical long distance Commuter EV's are going to want to park at an outlet everyday. For employee parking, the authorized EV owner employee simply plugs into any convenient 120 VAC outlet. No special chargers or installation is required. She drives the same distance to work every day, so it is simple to pay for a monthly Charging Pass as shown here to compensate for the daily electricity used. For example, the Congressional FAST act of 2015 authorized federal employees to plug into any available 120v outlet at work and only pay a flat monthly rate of $15/month to get a charging placard to display while charging. This is as easy to enforce as handicapped parking and is nearly impossible to abuse. A car has to be plugged in for at least 5 hours even to consume $1 of daily charge. It is impossible to charge-and run from a 120v outlet. EV Charging Outlets Everywhere! Employers, Churches, Schools, Hotels all over Maryland are beginning to recognize the value that each of their existing outdoor outlets have to their employees, members and visitors. And it makes no sense to spend $10,000 on a special charging station when their existing outlets can do. And it makes no sense to spend money on charge-card devicces to collect 20 cents an hour when the value of servicing their visitors is worth so much more. See some of the numerous examples. EV's have a big impact on the grid: Not if you understand the EV charging pardigm and all of the above we have mentioned so far. An EV charging-while-parked on 120v draws no more power than a toaster or coffepot as shown below. It is limited to the same 12 amp draw as any other appliance plugged into a standard outlet. What confuses people are those that refuse to let go of the gas-station/gas-tank legacy and want to charge as fast as possible. In that case, sure, there is a huge impact on the grid! In fact, a Tesla charging in 20 minutes can draw as much power as 24 standard homes as shown below. This is a huge, umbelivable impact. But completely unnecessary to the commuter and local traveler who simply plugsin while parked. Teslas are too expensive: So are a Maseratti, a Bently and a RollsRoyce. The Tesla is an exception to the value of an Electric Car. By 2018, many makes and models were being sold with over 200 mile ranges that makes it possible to completely replace the full flexibility and out-perform the highly versatile gas tank car. But it does so at higher cost. Further, now these cars come close to the gas-tank expectations, with rapid L3 chargers appearing on all the interstates. These are fantastic cars and excellent examples of where the EV car will eventually arrive. EV's are not clean but only move emissions to the power plant: A huge exaggeration! Yes, but only 7% of the emissions compared to a gas car! A study in 2016 showed that, about 50% of all EV buyers also buy solar or subscribe to Wind energy from their utility. This should not be surprising because these buyers are both early adopters of clean transportation and also invest in CLEAN energy. Another study by Ford in 2015, indicated that 83% of EV purchasers either had solar or were planning on getting it. EV's depend on Coal: No. Most don't. In addition to the fact that more than 50% of EV owners use only 100% clean energy (solar and wind), it is also true that the EV only consumes about one third of the energy as the gas car, and finally, coal is only about half of our electric supply... and only getting smaller every day. The net result then is only about 7% of the emissions of a gas car and this number is only going down. Just dont forget, HALF of those EV drivers are actually running on 100% solar or wind by choice. They want to be part of the solution for our future instead of continuing to be part of the problem. What about EV Maintenance? Just look at the parts count between a gas engine and an EV above. In the Gas engine, not only are there ten times as many parts, they are ALL moving! In the EV motor, there is only one moving part, the rotor. 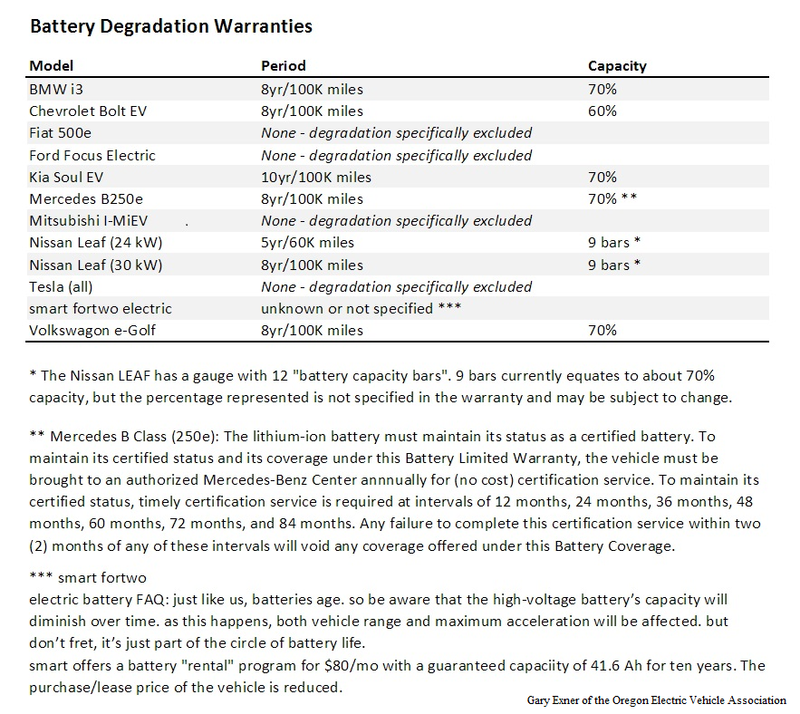 And remember, you can ONLY buy a gas car from a car REPAIR and MAINTENACE dealer instead of an EV you can buy direct from the MFR becauase there is so little to maintain. See the hilarious experience of an EV driver being sold a gas car. Another frustrating topic is the focus on METERING the electricity used by EV's charging at work. As noted in the image shown here, the daily costs to charge at work for the typical 20 mile commuter is about $1 a day ($2/day for a full 40 mile charge for say a VOLT). Therefore, it makes NO SENSE AT ALL to add thousands of $$$ dollars to the cost of the charging equipment to have internet access, credit card readers and very expensive charges for accounting and billing only to collect a single $1 per day. There is too much focus on the legacy gas-station model for electronic payment systems when there are much cheaper and more practical alternatives for the totally different every-day experience of EV charging.. Such as pay $15 per month. This shows the lack of understanding about EV's. The daily cost to charge is well known for any given employee. An EV is ideal for the routine of local commuting. It will therefore likely be driven EVERY day to work and will be CHARGED EVERYDAY, and the kWh to charge and the cost of that charge WILL BE THE SAME every day since the miles-to-work are the same everyday. Since both the employee and the employer both know where your home-of-record is located, then the cost for daily charging IS WELL KNOWN and the SAME every month. Just buy a charging-pass costing the price of 21 days a month and be done with it! It makes as much business sense to install expensive credit card L2 charging stations at-work as it does to install $5000 candy machines to sell 1 candy bar a day. Projected Charger Need in Maryland: The graph shown here was published in the Maryland Governor's EV Infrastructure Council (EVIC) in their final report of 2012 (and updated in 2017) showing the anticipated need for charging capability away-from-home throughout the state. Notice that the need for Fast Interstate charging is vanishinglly small (only about 0.3%) even though it seems to get most of the public's attention (who are still stuck in the gas-tank/gas-station legacy). Yes, there is a need for convenient public charging at retail locations where cars may stop for an hour or so, but the vast majority of charging away-from-home can be easily done at work, and 97% of that need can be satisfied by L1 charging outlets (120v). It is unsustainable to think these 50,000 charging options by 2021 are going to be anything other than a convenient $29 outlet (120v) to plug into while parked. Notice the DOE Does Allow EV Charging in their facilities. See details. See author's NPR interview in 2012 by Jessica Gould or hear it (2 mins). Download 2012 IEEE Paper on L1 Charging. Provides supporting justification for this concept. Download a Charging OUTLET sign or a Charging STATION sign. Charging at Park-N-Rides the common sense approach! Get the Charging-at-work Presentation from the DC EV Forum 12/12/11. Payin-to-Plugin SUMMARY: The Level-1 120v outlets exist, or can be installed at minimal cost. Lets go for the low hanging fruit with respect to EV charging and enable the existing 120v outlets scattered around first. Writing a letter to every Garage, hotel, apartment, condo, church or Bar owner that has existing 120v outdoor outlets can jump-start EV acceptance overnight at no cost. 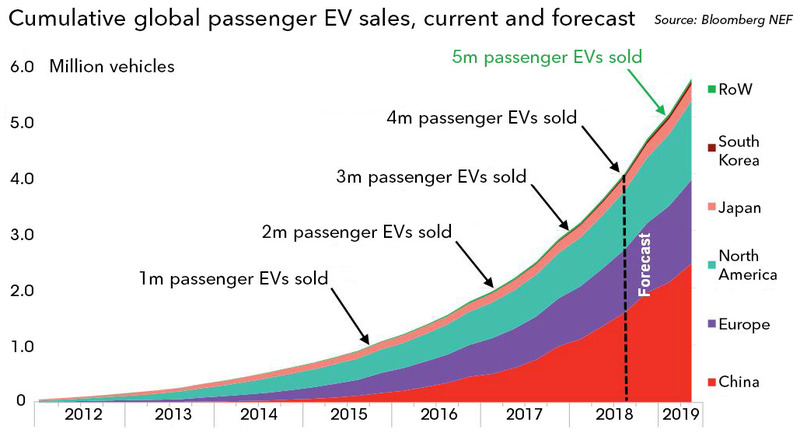 Here is a plot of the explosive growth of EV's worldwide with the USA leading the pack. You can also download a powerpoint summary of this web page (see top of page). See also the page on Payin-to-Plugin for easy use of 120v outlets at work. See also the page on EV and Gas Road and Environmental Use Taxes maintaining Parity download 1 page paper .